Where Are the Holiday Shoppers? I was dreading it. Who in their right mind goes to a mall on December 21? In America, such a trip would involve driving in circles for 30 minutes looking for a parking spot and then fighting hordes of angry Christmas procrastinators. The Mall at Rosebank, 4:00 p.m., December 21. Tyson’s Corner Center in Northern Virginia is never this empty, not even at 9:00 a.m. on a Tuesday morning in August. What’s happening here? Is this normal for Christmas week in Johannesburg, or is the economy really as bad as everyone says? Or maybe everyone is buying their holiday gifts from hardworking street artists like Felix and Lovemore. I hope that’s it! Speculation from experienced South African shoppers is welcome. Check back for more Christmas Below the Equator posts as the week progresses. 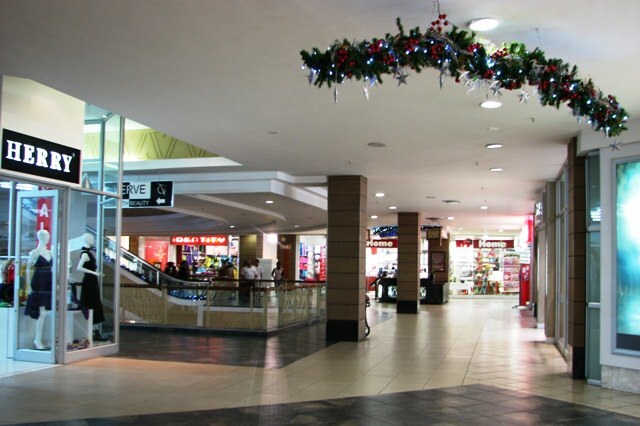 All the Joburg shoppers are on holiday at the coast, filling up our malls! 🙂 Seriously. I am avoiding going to the local mall until the New Year. When we lived there it was always busy at the malls, any time of year. I’ve never seen it that empty. Must be the recession; it’s similar here: we did our food shop yesterday and didn’t have to queue. I’ve never known anything like it. Yep – they are all in Plett – on the beach with their umbrellas. Also many South Africans leave their Christmas shopping till the 23 and 24th so it might fill up a little today. That’s wonderful to hear. Don’t feel ashamed — I was the same way when I lived in Washington DC. It’s easy to take your home city for granted.